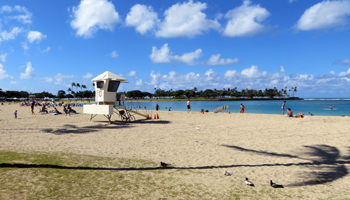 Ala Moana Beach Park: One of the Most Popular Hawaii Beaches on Oahu. Where the Locals Go for Hawaii Family Fun! 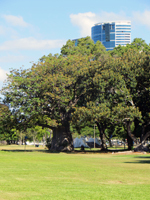 The Ala Moana State Regional Park, which is more commonly called Ala Moana Beach Park by the locals, is one of the most popular outdoor recreation areas in all of Honolulu. It’s centrally located. The facilities are well maintained. And it’s got everything you need to have some Hawaii family fun. Just give us any reason at all to gather – nice weather, somebody’s birthday, fun runs, major events, water sports activities, or nothing good on television – and we’ll be there ready to fire up the grill and unload the beach gear! 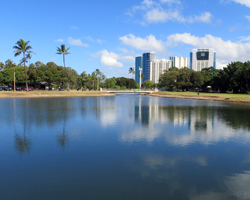 Located directly across Ala Moana Blvd from the Ala Moana Shopping Center and adjacent to Magic Island, Ala Moana Beach Park is 76-acres of grass, sand, and good times. 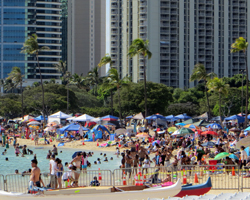 Basically, it’s the Honolulu equivalent of Waikiki Beach – with more local residents and fewer visitors. But that’s not to say Hawaii vacationers aren’t welcome. 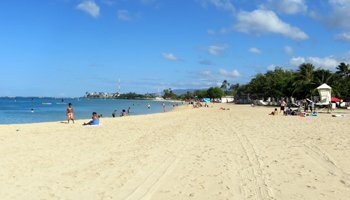 The majority just have a tendency to stay in Waikiki, while locals tend to prefer the plentiful free parking at this Hawaiian beach. The sand and shallows at the beach are protected by an artificial reef, which keeps the sand from washing away and creates a large, calm swimming area that hardly ever sees a shore break. As a result, this is a nice, safe play area for young children and anybody who’s uncomfortable in ocean swells. If you think you might like to try stand-up paddle boarding, you might want to consider getting a rental board and inclusive access to dozens of other Oahu attractions with a Go Oahu Card: Shop now and save up to 55% off Oahu's top tours and attractions! Link opens a new window/tab. Nearly every day of the week, you’ll see Ala Moana Beach crowded (but not as crowded as Waikiki Beach) with sunbathers, surfers, stand-up paddle boarders, swimmers, boogie boarders, and kids playing in the abundant clean white sand. There will be families out with their grills and canopies, obviously intending to be there for the whole day. And you probably also see one or two wedding parties there for a few minutes with a photographer to make some magical memories. 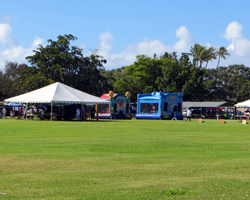 Meanwhile, in the park itself, you could see any number of group events from small family parties to huge community festivals. Some of these events will be private, and others will be open to the public. When in doubt, just ask. You might make a friend. But even when there are no events, you’ll still see people playing tennis or various field sports. They’ll be walking, running, riding bicycles, and exercising. They might be playing with remote-controlled boats in the park’s ponds. Or they might just be napping in the shade and cool breezes. It’s a park. Let your kids burn off some excess energy while you replenish yours by enjoying some relaxation and fresh air. 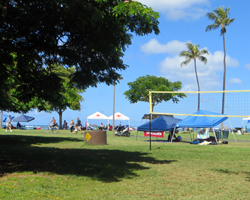 Facilities at Ala Moana Beach Park include well-maintained public restrooms with showers, a concession stand, and lifeguards on duty during normal daytime hours. Additionally, the park is frequently patrolled by police to minimize the potential for problems; but even so, I wouldn’t leave my belongings unattended out in the open. That’s asking for trouble no matter where you are. Parking is usually great during the work week, but it can fill up fast on weekends. If you choose to go on a Saturday, Sunday, or holiday, you may find it best to arrive early or later in the afternoon. Every evening (weather permitting) you’ll get some of Hawaii’s best free entertainment in the form of a spectacular Hawaii sunset. On Friday evenings, you can watch the Friday Night Champagne Series sailboat regatta blow past. Then turn around and watch the Waikiki fireworks. But perhaps the biggest event at the Ala Moana Beach Park is our annual Memorial Day Lantern Floating Hawaii event. That’s when 40,000 people pack the park to celebrate the lives of those who have passed. The list of activities goes on and on, but I’m sure you get the picture. 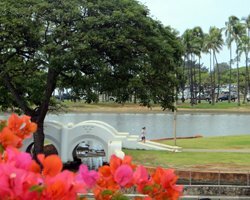 My point is this: when you want to get out and enjoy our beautiful Hawaii climate the way many locals do, you might want to make a visit to Ala Moana Beach – one of the most popular of all Oahu beaches. Disclaimer: No matter how calm conditions normally tend to be at this Hawaii beach, and no matter how skilled the lifeguards and police are at doing their jobs, your safety is still ultimately your responsibility. You need to watch your children carefully. You need to know their limits and your own. Then you need to make sure everybody stays within those limits. Use liberal amounts of good judgment and sunscreen, because when you do, you help ensure your Hawaii vacation will be the most enjoyable it can possibly be.